I don’t want to make this a technical article, but anyone who is a serious bodybuilder has to begin to have some understanding of these things. The muscles you need to know about in this article are the bicep brachii which consists of two heads ( we will call these,” the biceps”) and the biceps brachialis which lies under the brachii and the brachioradialis, which is also part of the forearm. How these muscles work is the main thing that will give you a better understanding when we get to exercises and the lack of this knowledge is the main reason guys don’t get bigger arms. The movement of the arm from full extension (down) to full contraction (all the way up) is more than one muscle can do because of the distance the arm moves. This just has to do with simple leverage principles that I will not go into here. What you must understand is that it takes more than one muscle to smoothly move the arm through the full range of motion or in other words keep this movement fluid /smooth all the way up and down. What we have is the 4 bicep muscles working together to complete this movement. There is an overlap in the work done by the individual muscles, #1 (brachioradialis) will start the movement due to it’s position on the arm. 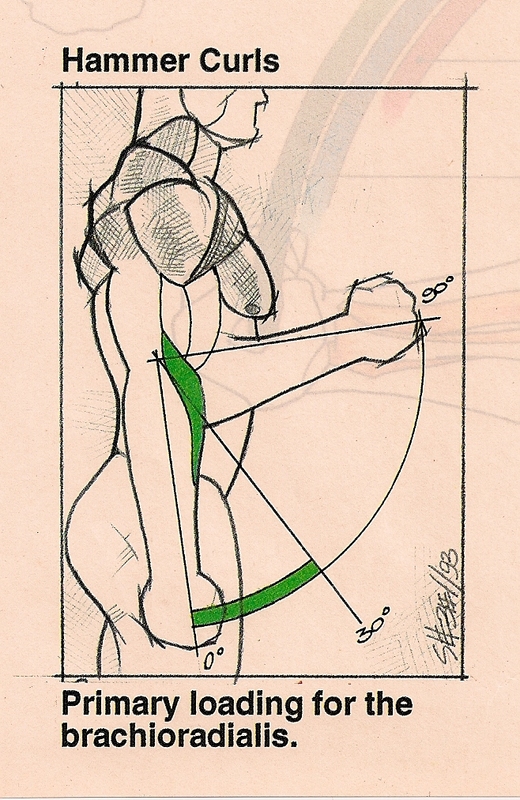 Once movement is created #2 and #3 (Biceps) will take over, when #2 and #3 is reaching the end of it’s movement area #4 (brachialis) now starts working and takes over to complete the movement of the arm curl. In bodybuilding it is important to know just when each muscle starts and stops working because we want to work each during it’s strong part to get the best possible results. This is the reason that so many guys cheat doing exercises because they don’t understand the importance of understanding the strong and weak parts of the total arm movement. 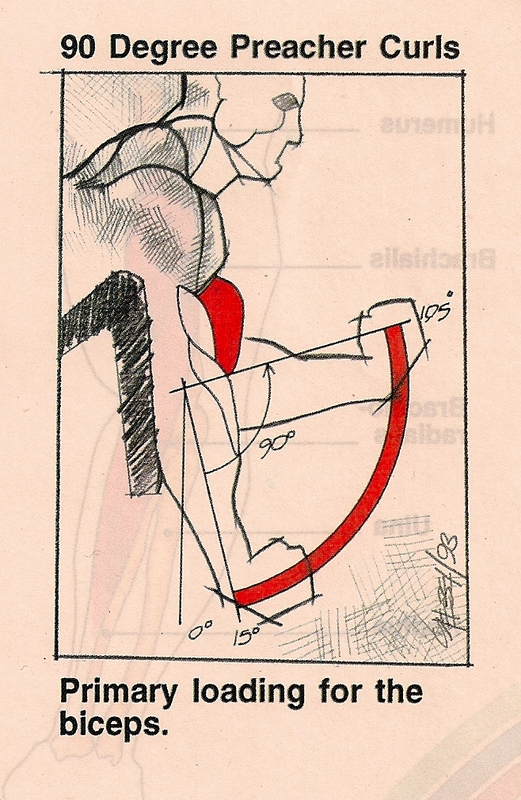 Thus, cheating through the weak links actually means you are jumping over a section of the muscle. This cheating through the weak sections keeps that area from growing. This is why you always hear do perfect form, but more than that you now should begin to learn why perfect form is so important. When you understand this you can build bigger biceps faster. The question becomes do you want to move weight from point A to point B or do you want to work the full biceps muscles, thus getting bigger arms? I have already discussed in previous articles that a muscle works the hardest from a complete start. When it comes to moving a limb, some muscles do a better job of doing their work than others depending on where they are in relationship to the joints. Now this may seem complicated but if you think about when you do a curl where the hardest and easiest section are it will become clearer. 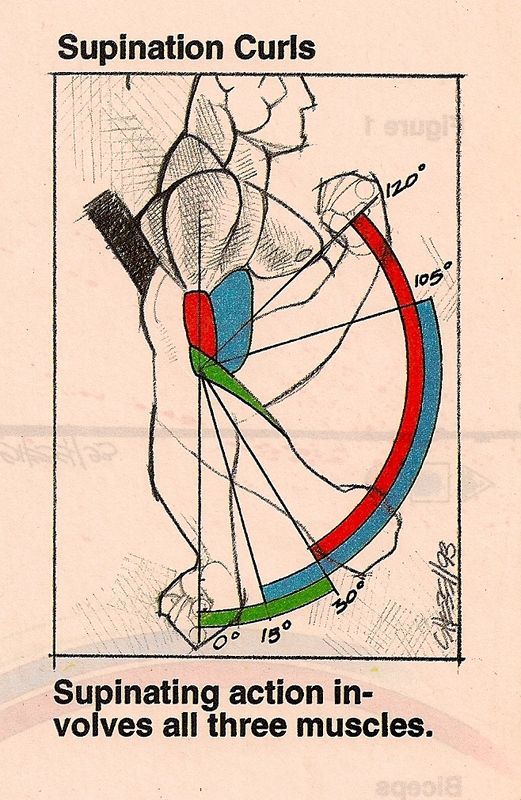 What you can see from this explanation is that each muscle has a specific range that it works in. THUS, as a bodybuilder you must understand you need to work the exercises that focus on these different movement areas. Lets look at the exercises I suggest and the order in which to do them. Straight bar curls: this exercise like the squat or the bench press the king of biceps. I suggest you do it first. You will see in the video that a straight bar is used with the bar gripped about 10 degrees out. NOT straight forward. EZ curls bars were made for guys that wanted an easy way to do these curls NOT work the biceps. Forget the EZ curl bar. Preacher curls, now that you have done the main movement it is time to start picking exercises for the different biceps muscles and doing these exercises in their particular range of motion. To best focus on the 2 heads of the biceps use the flat side of a preacher bench to support the shoulders and again a straight bar with the hands 10 degrees out. The range you will work is start at 15 to 30 degrees and come up to 105 Degrees. Rotation/Supinating DB curls. 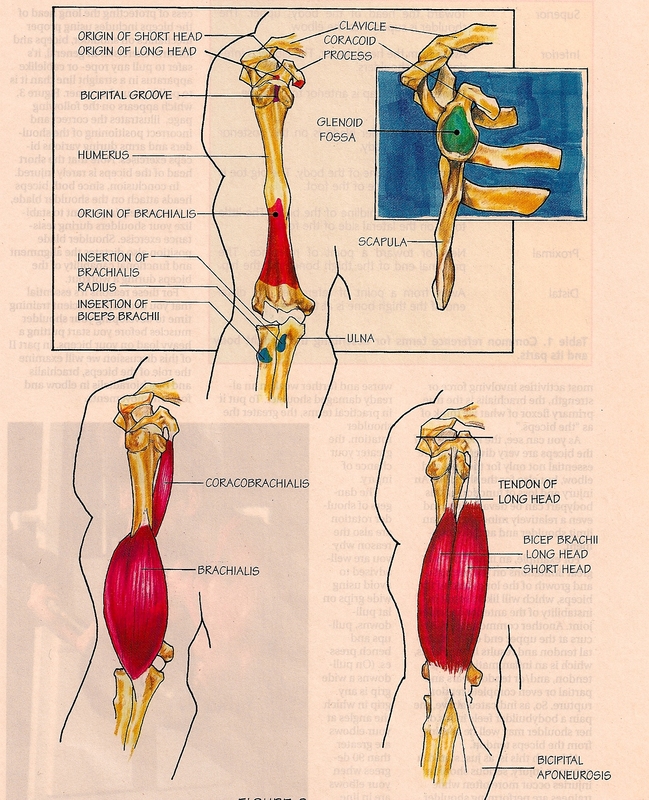 If you look at kendell and kendell muscle function book you will see that the biceps raps around the bone in the forearm, thus turning the arm as it moves. This is why the next exercise is rotation or supinating DB curls. Set the back of your bench on a 15 degree decline so you get a full stretch at the shoulders. Start with the back of your hand facing forward and rotate the hand as you do the curl. Concentration curls- this exercise is probably the exercise that is the least understood and most poorly done because of this lack of understanding. Bodybuilders in the old days always said this was the “peaking” movement. No one ever really understood why, but the old time guys all agreed it gave them a peak. I will use this as an example of what you have learned in the earlier part of this article. 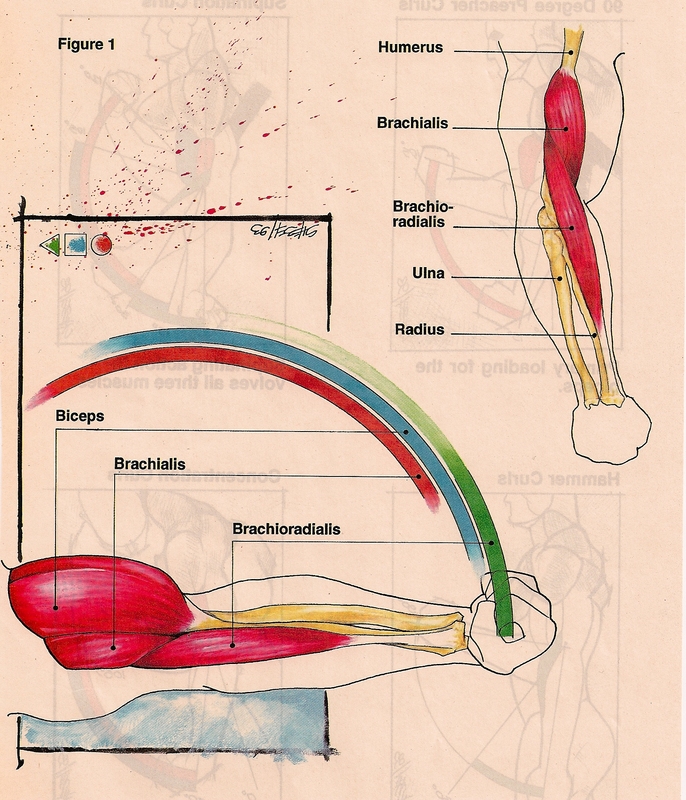 If you look at a muscle diagram you will see brahialis muscle attaches on the arm bone “under” the Biceps. 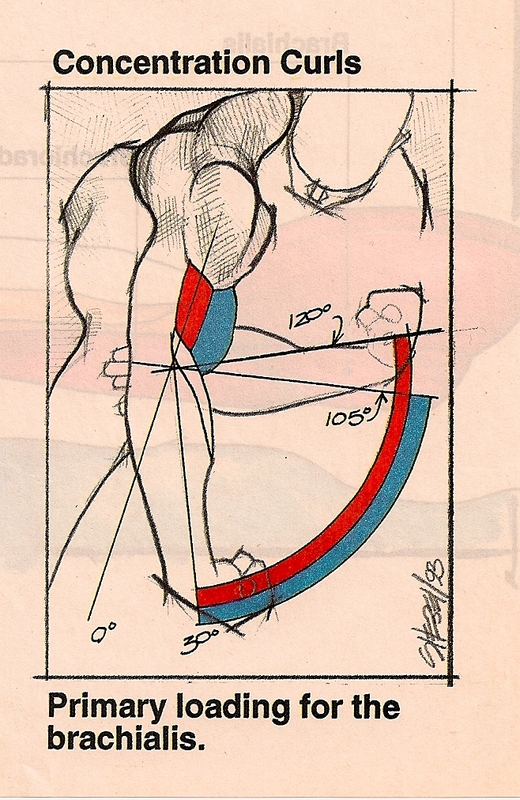 When this muscles is developed it “PUSHES” the 2 biceps muscles up and thus the “peak”. I have also explained how it starts it main work at 15-30 degrees (Figure 3 and4) and works to around 120 degrees which is the end part of the arm curl motion. The position you start in here is because the way this muscle attaches to the arm. The key here is to slight rotate the hand up at the beginning. DON’t go all the way down but start the movement at 15- 30 degrees and then contract the muscle all the way to the top. The shoulder should stay over the elbow, do not allow it to move back (cheat) Keep in mind the reason you want to move your shoulder back is, at this end part of the movement the 2 biceps muscles have stopped working ,so you will feel weaker at this part. Don’t cheat, understand why you are weaker. Hammer Curls- this is the exercise that you can finish with. Even though the largest part of this muscle is in the forearm it has a main function in working the biceps. Use a set of dumbbells, let the arms hang strain down with the hands rotated so the thumb faces up. 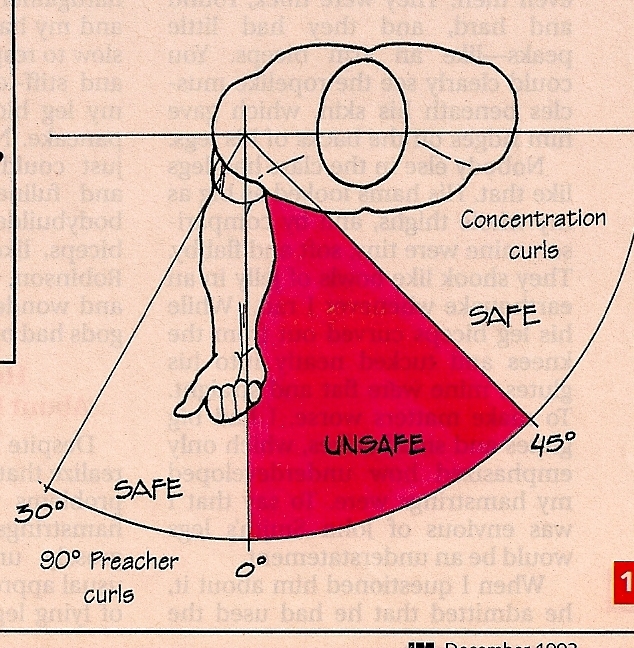 Thus the hammer curl position. Remember this movement is done for the lower section of the biceps so the start of this curl must e slow and perfect. Come all the way up to 90 Degrees, which is the range for this muscle. See figure 1. Since it is that starter muscle for your straight bar curls you need to work it. Weakness in this muscle starts the whole cheating process and thus takes away the size of the biceps, especially the lower section of the biceps. I will now talk a little out of my science /teacher role and more into the musclehead part of me. As I said in the beginning of this article the Biceps are the show muscle in our sport and let’s face it everyone loves to work them. So, even though I am talking about a small muscle to have fun you need to work a few sets of each of the exercises I explained. A good starter workout would be 2 times a week after your back workout the biceps are already warmed up. Straight Bar curls: 3 sets x 8 perfect reps. Nice and slow to prevent cheating. Preacher Curls bench: 3 sets x 8 perfect reps. This is a fun exercise for a great pump. Rotation/Supinating DB curls: 2 sets x 8 reps. You arms will start to get tired now. Concentration curls: 2 sets x 8 reps. Since all the above exercises have worked this muscle a little too, 2 sets is great. Hammer Curls: 2 sets x 8 reps. By the time you get to this exercise. You will be ready for the shower. After you have tried this workout now you can go back and think about the old exercises you did or the variations of these exercises that you may have done and like. The same when it comes to sets and reps, Now you can better make a informed decision on how much you want to do. When i was with Ironman Magazine one of the artist there did some really cool pictures to show all this science in a visual way. You might enjoy them. Thanks to Iron Man magazine and artist Peter Schebell. Next article will speak about the other half of the arms the triceps. Wait to you see what science has to say about them. You will be surprised. Great article for those who want to add size to their biceps. As well as getting a bit of an understanding of the muscles that surround the Humerus, Ulna, and Radius. An impressive share! I’ve just forwarded this onto a co-worker who had been conducting a little homework on this. And he actually ordered me breakfast due to the fact that I discovered it for him… lol. So allow me to reword this…. Thank YOU for the meal!! But yeah, thanks for spending some time to discuss this matter here on your internet site. Go for the protein and carbs and then a pump….. Thanks for the great article! Just one question: Should we be squeezing when we reach the top? You can if you want but just doing the full range of motion and stopping at the top for 1 second can be called squeezing. Wish all websites would provide such detailed information on how muscles work and how to build them up, loved your work here and wish you had more to show on similar topics!